The effects of deregulation of the airline industry in the late 70s – from an article by the always insightful Steven Pearlstein. 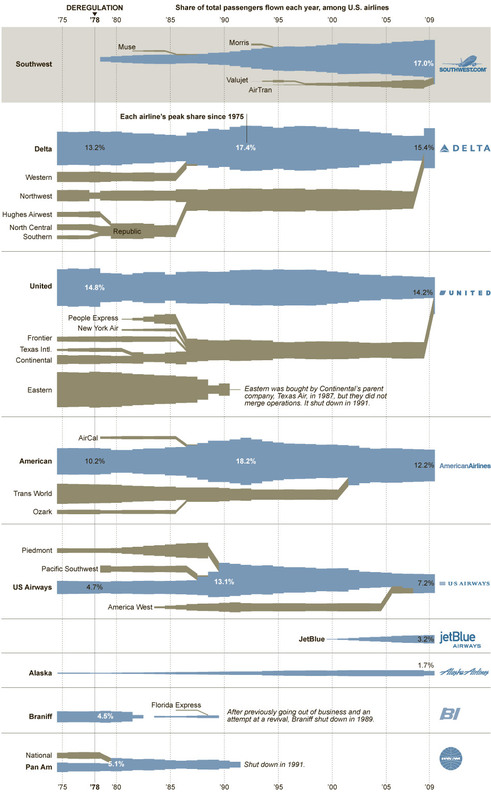 Somewhat ironically, the original expansion of competition that deregulation was supposed to create has now entirely disappeared (the below could be updated to show the recent USAir/American merger). Argh!! You can demonstrate the effects of anything by starting the trend line at the year of the change. You have to show the years prior to be able to evaluate a potential effect. People make this same mistake all the time when evaluating the effect of deregulation and airline safety and it’s incredibly misleading. The same thing happened to truck cargo prices after the ICC was eliminated and freight rates were deregulated though it’s less visible to the consumer.